Okay, so I was cleaning this morning (if that’s not enough to bring about the end of the world, I don’t know what is), and I came across some of my old writings. One in particular that’s appropriate for this time of year is Deb and the Phantom Caretaker. I wrote this story to use for the writing class I taught one year. We were studying fiction writing, and that particular day’s lesson had to do with finding story inspiration in things that happened in real life. I recalled an event that happened when I was a teenager. My cousin Regina was visiting from New York, and she, my sister-in-law Linda (who was kind of irresponsible and a bad influence, but at that time she was my best friend), and I went for a twilight walk around town. As we passed Oak Hill Cemetery, Linda and Regina both dared me to walk to the middle of the cemetery, even though it was getting pretty dark. I thought nothing of it and wasn’t afraid at all. I took the dare and started walking. I only got about halfway in before a bunch of bats flew past, very low, and scared the daylights out of me. That’s all there was to the story, but I took it and turned it into a fun, not-too-spooky ghost story with a comical ending. So here it is, for your reading enjoyment. The streetlights had just come on as I crossed Race Street and headed for the path that led into Oak Hill Cemetery. I could hear my sister Linda and my cousin Gina giggling as they watched me slowly make my way towards the rows of tombstones. “Me and my big mouth,” I muttered as my eyes adjusted to the deepening shadows. I wouldn’t be in a graveyard at twilight if I hadn’t been scoffing while Linda and Gina told ghost stories. 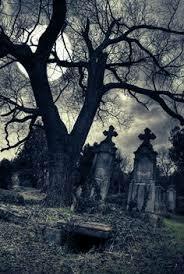 And I really should have kept my mouth shut when Linda told the story about the phantom caretaker who grabbed anyone foolish enough to touch the oak tree in the center of the graveyard after dark. “There’s no phantom caretaker,” I snorted. “That’s just a story.” Truth was, I had heard that story before, and I was trying to convince myself it wasn’t true. “Well, if it’s not true, Deb, then prove it!” Gina challenged with a smirk. I couldn’t talk my way out of it without admitting I really did believe in the phantom caretaker, so there I was in the deepening twilight, trudging up the winding path that led to the oak tree in the middle of the cemetery where the phantom caretaker lurked. When I reached the oak tree, I was supposed to signal Linda and Gina with the flashlight I carried in my pocket. I wanted to turn it on to give me some light, but I didn’t want to betray my presence to anyone or anything else that might be creeping through the cemetery. The breeze hissed eerily through the grass, and the headlights from passing cars made spooky patterns on the tombstones as I rounded the last curve in the path. The oak tree was only about 50 feet in front of me. I pulled the flashlight out of my pocket so that when I reached the tree I could signal Linda and Gina and get out of there. In my haste, I lost my grip on it, and despite my wild grasping, my only source of light clattered to the sidewalk in pieces. By the time my punishment ended a week later, the whole town had heard about Linda and Gina’s dare, my trek into Oak Hill Cemetery after dark, and my encounter with the phantom caretaker—who had turned out to be my dad’s cousin, Officer Hoke.